But the grimmest news was, once again, reserved for parents whose children are still learning English — particularly for those in LA Unified schools. 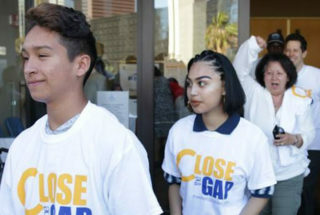 English learners, who represent nearly a quarter of LA Unified’s half a million students, showed no growth at all in reading over last year, and their math scores inched up by only a minuscule 0.04 percentage point, according to state results on the CAASPP tests released last week. Statewide, they gained less than 1 percentage point over last year. English learners’ test scores in California and LA have barely budged since the new tests were introduced four years ago, even though the state has funneled more funds to school districts with high numbers of English learners and other disadvantaged students. And English learners’ performance remains at the bottom of all subgroups of students, lower than for all ethnic groups and for all students receiving special education and those in poverty. In each of the last three years, less than 4 percent of LA Unified’s English learners scored proficient in reading and less than 6 percent did so in math — significantly lower than their peers statewide. LA Unified posted slightly more progress with its reclassified English learners, those who have completed a four-step process that includes passing the state’s English proficiency test. But they still lag behind the statewide rate. Lavadenz outlined a range of factors that contributed to the “depressing test scores,” including the specific challenges to these students and how school districts are supporting both them and their teachers. The students are clearly struggling with the content as well as the language. “When English learners are tested at any test, any assessment that is in English is also a test of the language as well as of academic content proficiency,” Lavadenz said. The language barrier affects students even in math, because those sections of the test are also heavily language-based, making them difficult for English learners, she said. And school districts are not consistently using accommodations available for English learners during testing. Teachers also need more training and support to better prepare their English learning students for the test and to learn how they can understand students’ progress in previous academic years. Getting all teachers the tools and training to teach English learners should be “a non-negotiable,” Lavadenz said. She said newer teachers also need to be coached and mentored into the profession as research shows that the youngest and least prepared teachers tend to be placed in schools and in communities with higher poverty rates and a high concentration of English learners. These teachers aren’t getting the support they need and end up leaving those schools. Attempts to raise English learners’ proficiency rates have yet to bear fruit, such as the new California English Learner Roadmap and millions of extra dollars that have been spent supporting English learners and other disadvantaged students over the last five years through the Local Control Funding Formula. Over 20 percent of the students in California’s public schools — or 1.3 million children — are English learners who speak any of about 65 languages other than English, but an overwhelming majority, 82 percent, list Spanish as their first language at home. Did you provide accommodations for my English learner child during the testing? What kind? What kind of preparation are they getting for the test? How can I support you with my child at home to be better prepared for the test? Are there any resources available in my native language that I can use to help prepare my child? Are you providing tutoring for the test after school?